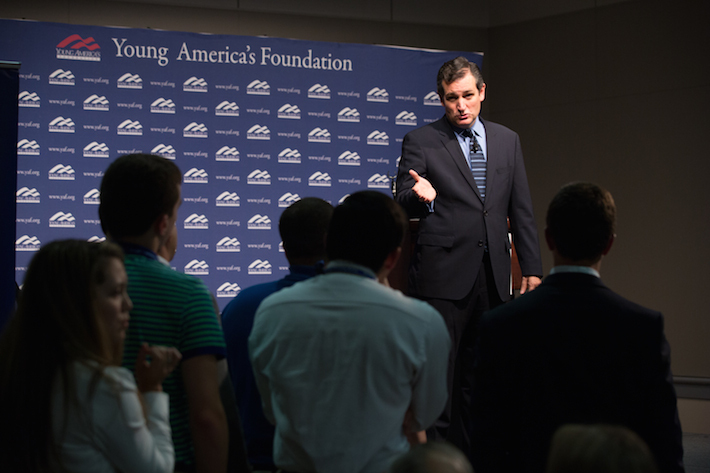 Former speaker of the House headlines Day 1 of National Conservative Student Conference at GW. Former Speaker of the House Newt Gingrich provided remarks to kick off the 36th annual National Conservative Student Conference at GW on Tuesday. Newt Gingrich stepped to the podium, thanked the crowd and outlined the topics of his speech, then paused for a second. Mr. Gingrich, speaking Tuesday morning to a crowd of about 200 at the George Washington University, kicked off the 36th annual National Conservative Student Conference with a speech focused on using technology to advance, simplify and shrink what he called “the centralized bureaucratic model” of government. Smartphones, Mr. Gingrich said, have revolutionized the way and accelerated the rate at which the world processes information, providing an opportunity to redefine the way a society operates. In remarks about U.S. foreign affairs, Sen. Ted Cruz (R-Texas) recalled some of the straightforward techniques favored by former President Ronald Reagan. "He was asked what his strategy was on the Cold War, and he said 'It's very, very simple: we win, they lose.'" The weeklong conference, which continues through Friday and is hosted by the Young America’s Foundation, features a star-studded lineup of conservative leaders, including U.S. Senator Ted Cruz (R-Texas), author and radio host Herman Cain, former Virginia Attorney General Ken Cuccinelli, U.S. Senator Tim Scott (R-S.C.) and U.S. Senator Marco Rubio (R-Fla.). Mr. Gingrich, who held the speakership from 1995 to 1999, offered his idea for the first government area in need of an IT improvement: the VA, which has been mired in scandal since reports surfaced in April of veterans dying while waiting for care. Making government more efficient, people-friendly and accessible was a theme that continued throughout the day and resonated with Tory McClintock, a rising sophomore in GW’s School of Business. Ms. McClintock is studying business administration, public policy and economics, and sees a future in which government and business, long believed to be at odds, coexist. Ms. McClintock, a member of the GW chapter of the Young America’s Foundation, came back into town from the Philadelphia area for the conference and attended speeches given by Mr. Gingrich and Sen. Cruz, who spoke for 30 minutes Tuesday afternoon on domestic and foreign affairs and fielded questions from the crowd.